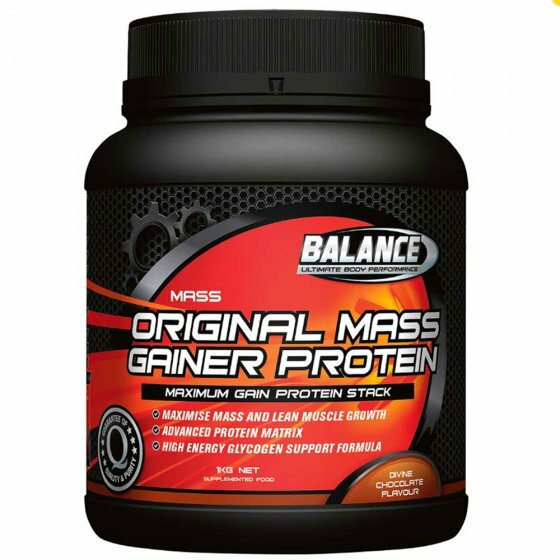 Balance Original Mass Gainer Protein is an advanced protein stack for optimum lean muscle weight gain. This unique formulation has a comprehensive blend of the finest quality proteins and essential amino acids. It is ideal for those hard gainers and includes a high concentration of BCAAs for recovery. The carbohydrate matrix provides the energy to support large muscle gains and to also assist in the recovery process. This combination minimises the breakdown of muscle protein. Directions: Add 65g (approximately 1 1/2 scoops) to 350mL water (or whole milk) and shake or blend until mixed. Can be used up to three times daily. Recommended Use: Use between meals to support metabolism or as recovery formula 60-90 minutes before training and/or within 30 minutes after exercise. Heavy Duty Protein Stack (45%) (Whey Protein Isolate, Whey Protein Concentrate, Soy Protein Isolate, Calcium Caseinate, Total Milk Protein, Hydrolysed Whey Protein Concentrate, Colostrum, Sodium Caseinate), Carbohydrate Blend (Dextrose, Fructose, Maltodextrins, Glucose Syrup Solids), Vegetable Fat, Glutamine, Flavours, Anticaking Agent (Silicon Dioxide), Vegetable Gum (Xanthan), Mineral Salts (339, 450), Emulsifiers (471, 472c, Soy Lecithin), Papain, Bromelains, Vitamins and Minerals (Ascorbic Acid, Vitamin E Acetate, Ferrous Fumarate, Nicotinamide, Zinc Oxide, Manganese Sulfate, Pyridoxine Hydrochloride, Cyanocobalamin, Calcium-d- Pantothenate, Riboflavin, Vitamin A Acetate, Thiamine Hydrochloride, Selenomethionine, Cholecalciferol, Folic Acid, Chromium Polynicotinate, Sodium Molybdate, Potassium Iodate, Biotin), Lactose, Antioxidant (Mixed Tocopherol Concentrate). Please Note: Contains Milk and Soy Products. Made in New Zealand from local and imported ingredients.